Oh, Rebecca Minkoff. Is there anything you can't do? (The answer is no.) I have a plethora of bags by my favorite designer, mainly because of this one simple fact: Once you buy one Rebecca Minkoff bag, you're a convert for life. I'm serious! 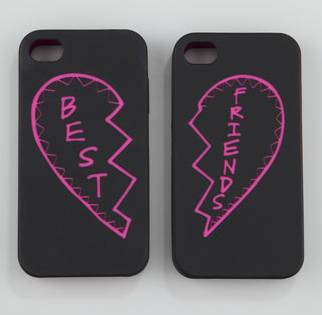 And today, one lucky winner has the chance to get the Rebecca Minkoff Best Friends iPhone 4 Case Set in Black/Pink. The best part about this gift? You can keep one and give one to your bestie (duh) -- so you're doing something good for someone else if you win! This giveaway has a retail value of $57. Here's how to enter. Note: PLEASE ONLY LEAVE ONE COMMENT! Do not leave additional comments about Facebook, Twitter and Pinterest entries or mention them in your one comment -- those are counted separately and you do not need to mention them here. Thanks! 2) Like The Beauty of Life on Facebook and leave a comment on the Facebook post about this giveaway telling me why you want to win this iPhone set. My new IPhone wants this cover! I hope I win the Rebecca Minkoff creation! I would love to win this iPhone cover! My iPhone is naked!!! Thanks for the giveaway!